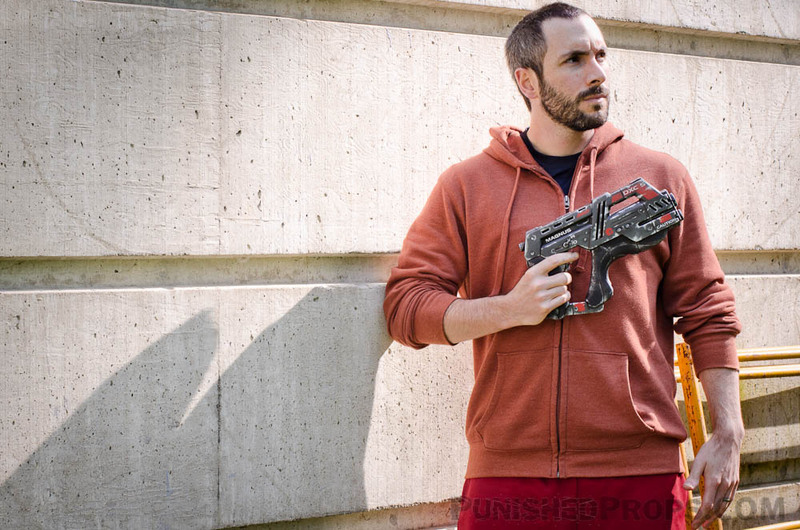 I had some interest from a couple of folks (including one fella who wanted one for his wedding) in me building a replica of the the M-6 Carnifex heavy pistol from Mass Effect. So I did. 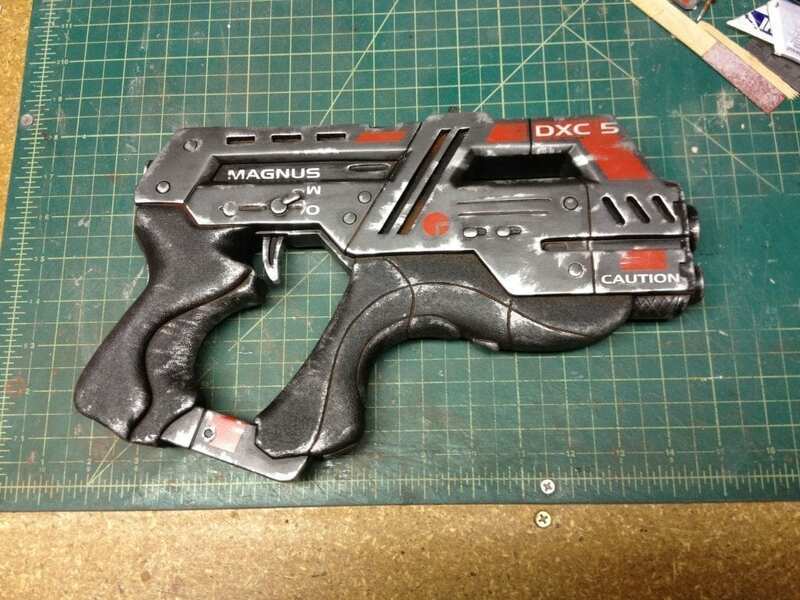 Update (August 2012): I painted a copy of this gun to look like the M-77 Paladin. I got my references from a nice person on deviantArt who goes by the moniker Troodon80. 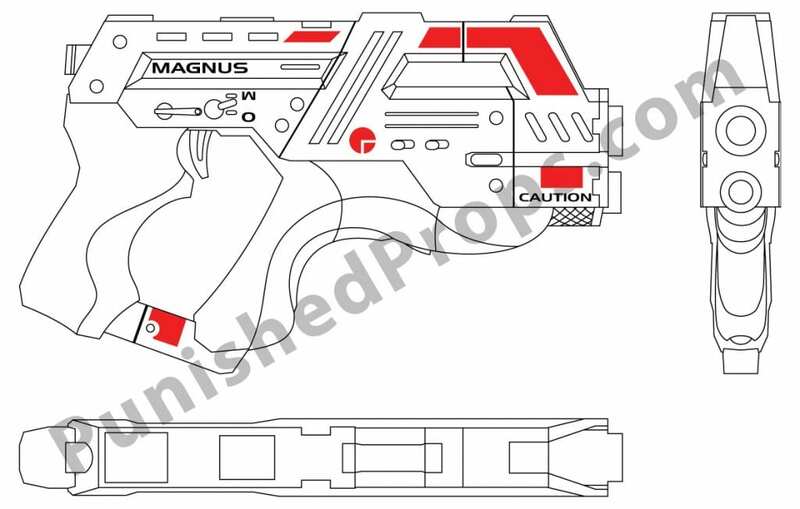 From said references I was able to put together some very detailed and accurate vector drawings of the gun. 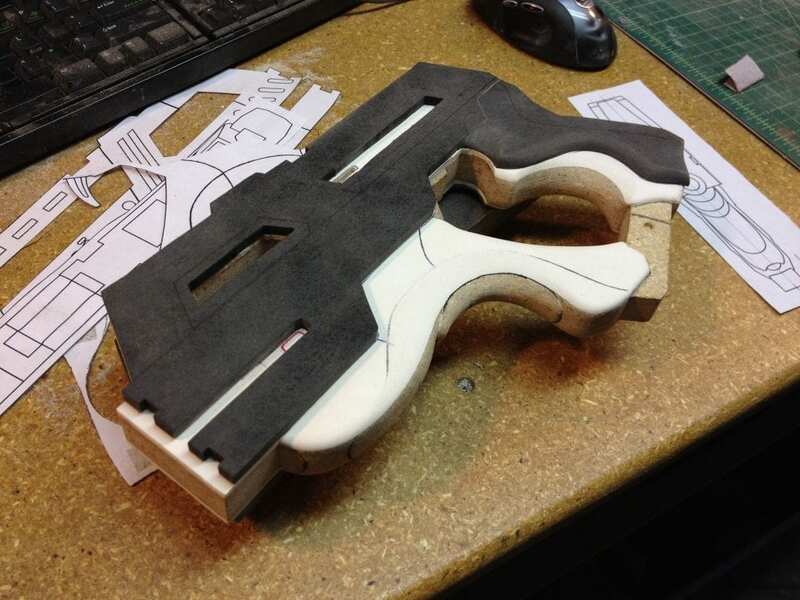 I decided to build this in layers, much like the way I built my N7 Eagle pistol. 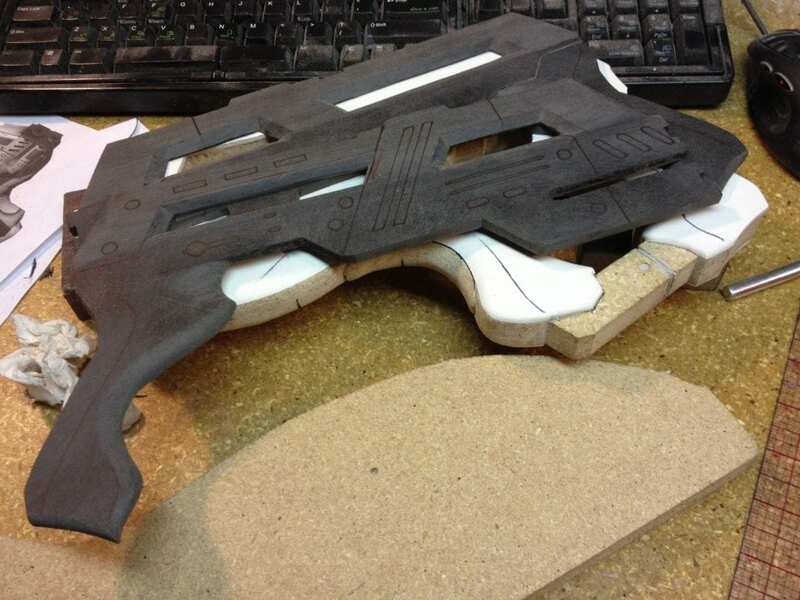 The middle layer is made from MDF and the two outer layers are made from foam PVC. 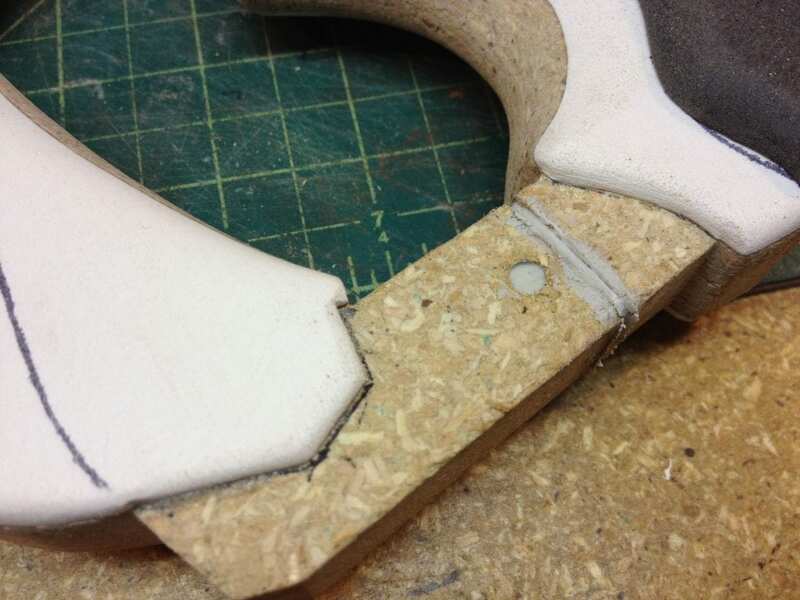 I did lots of shaping on the handle bits with my rotary tool and a sanding bit. 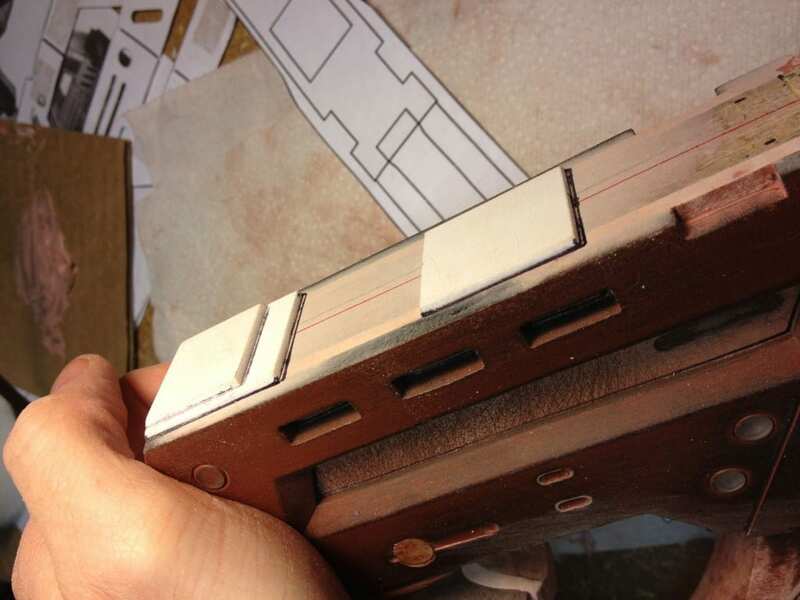 The outer black layer was kept unglued until all of the detail was done. It was much easier to monkey with it that way. Detail areas were filled in with Magic Sculpt. 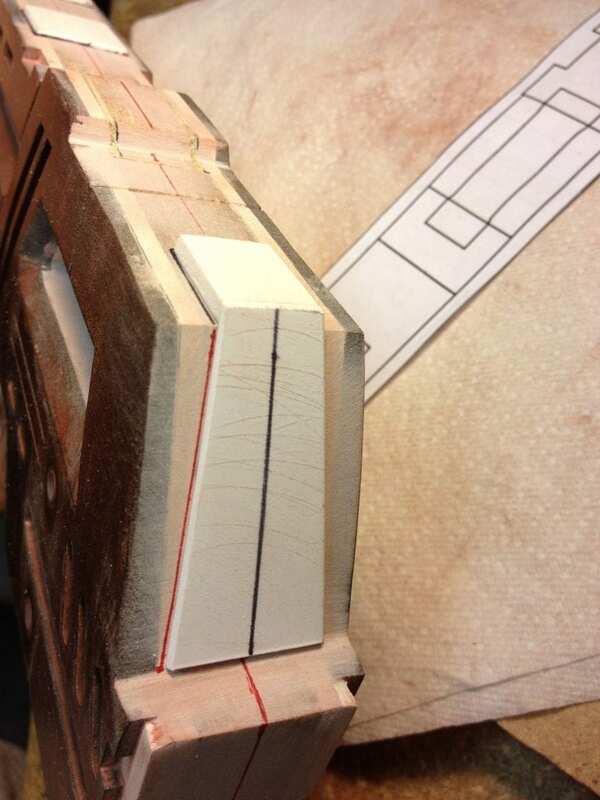 This helped preserve edges in areas with small details and detail in the crummy MDF that I used. 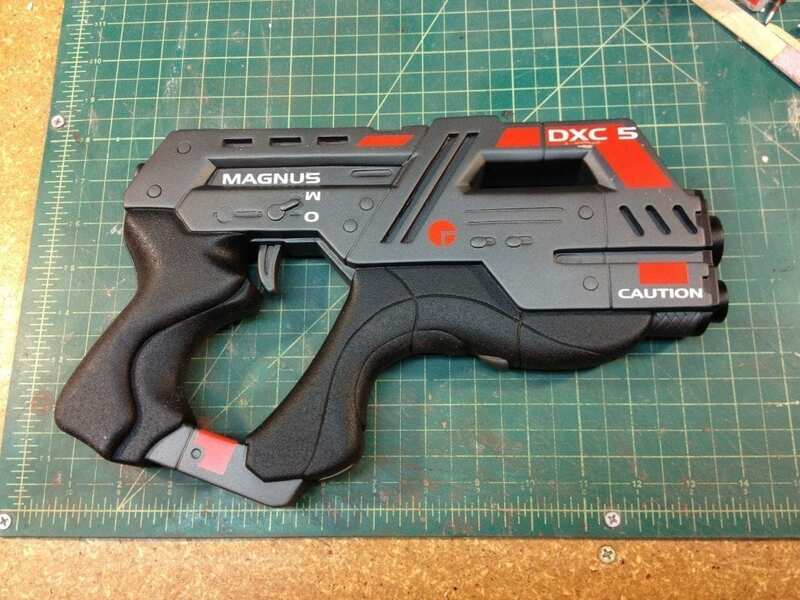 All of the details on the side pieces were traced on from the vector drawings that I printed out. 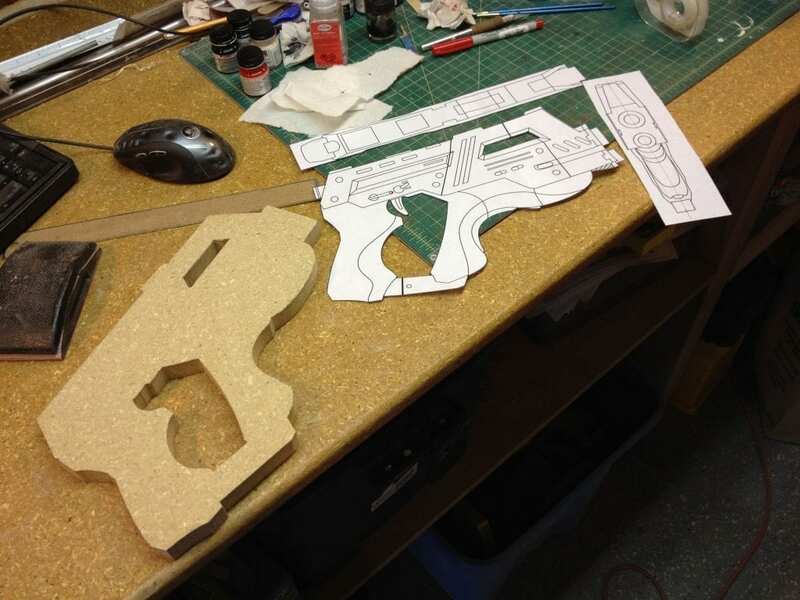 These details were then cut using my rotary tool and some small files. 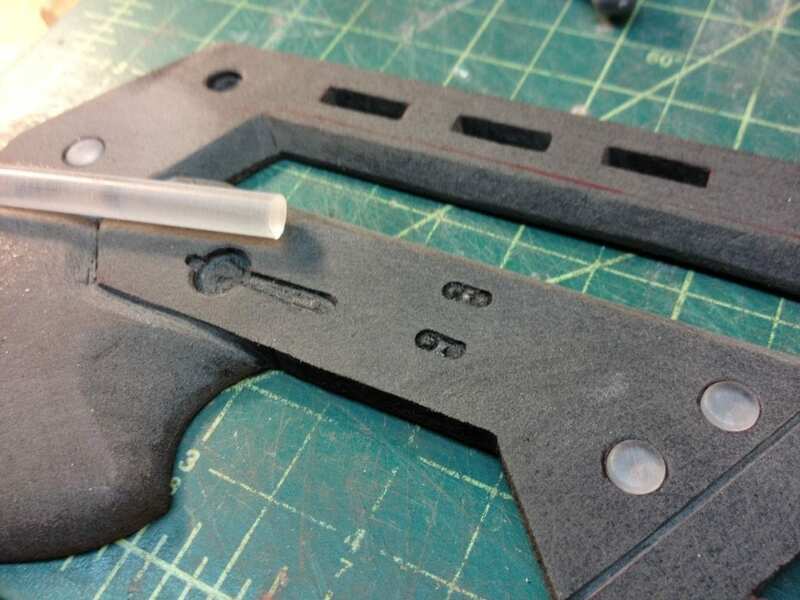 The circle bits were drilled and then filled with 1/4″ acrylic rod pieces. 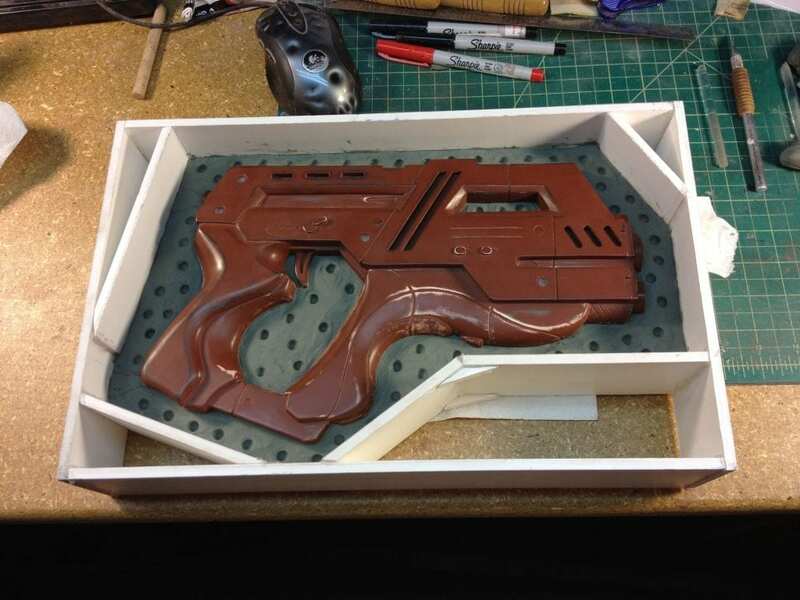 Other detail areas like the barrel end and top pieces were added by using 1/8″ pieces of foam PVC and 1/16″ pieces of styrene. The barrels were cut from two different sizes of PVC pipe. The weird thing below the barrels was also PVC pipe that I detailed with my small set of files and then capped with a piece of styrene. 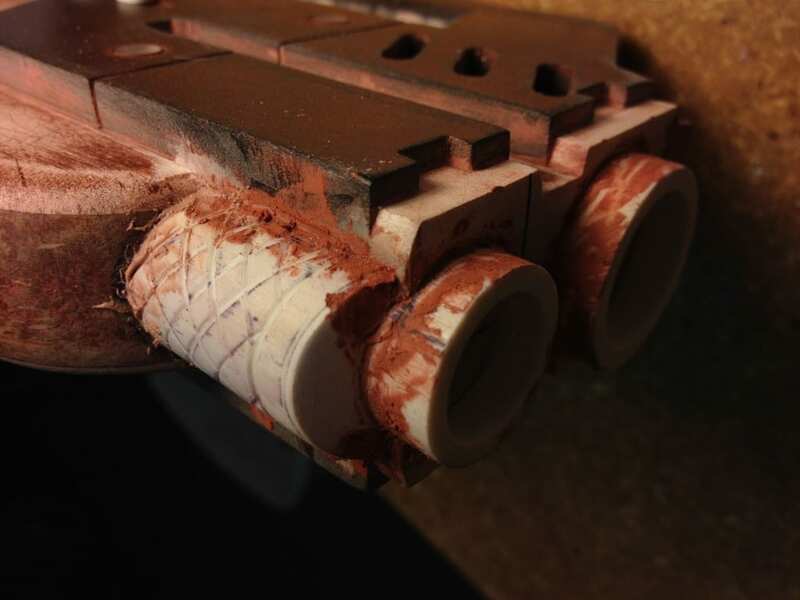 The cylinder that protrudes from the rear of the gun was cut from a 5/8″ piece of acrylic rod. 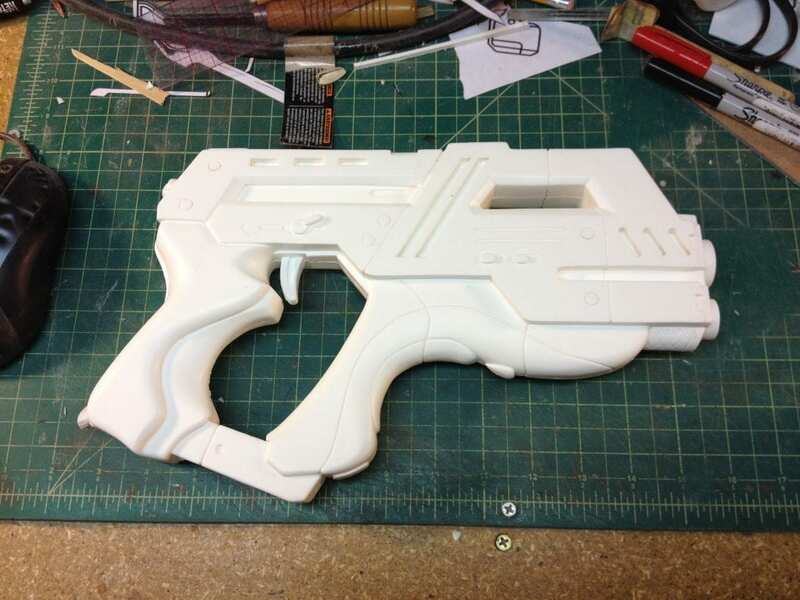 With all of the pieces finished, the whole thing got primed, sanded, puttied, sanded, primed, sanded… (you get the idea). 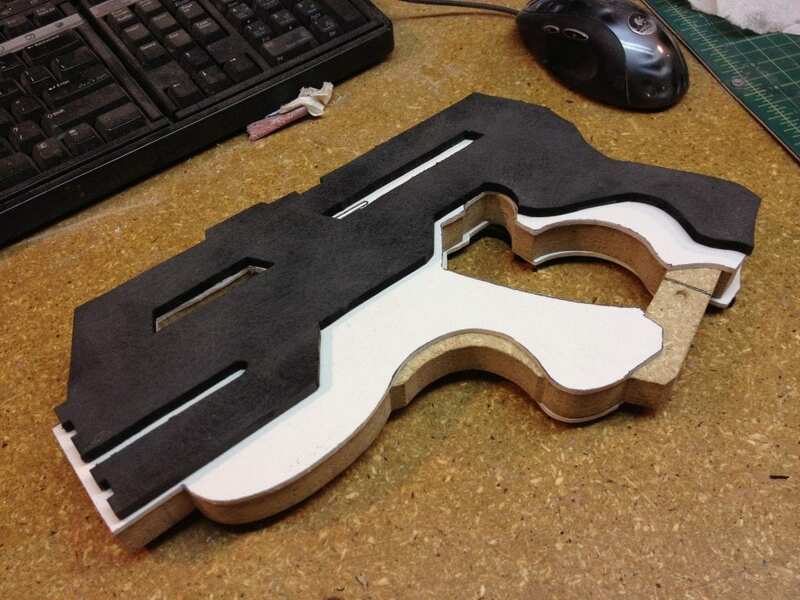 Cut to the chase; we have a gun that is ready for molding! 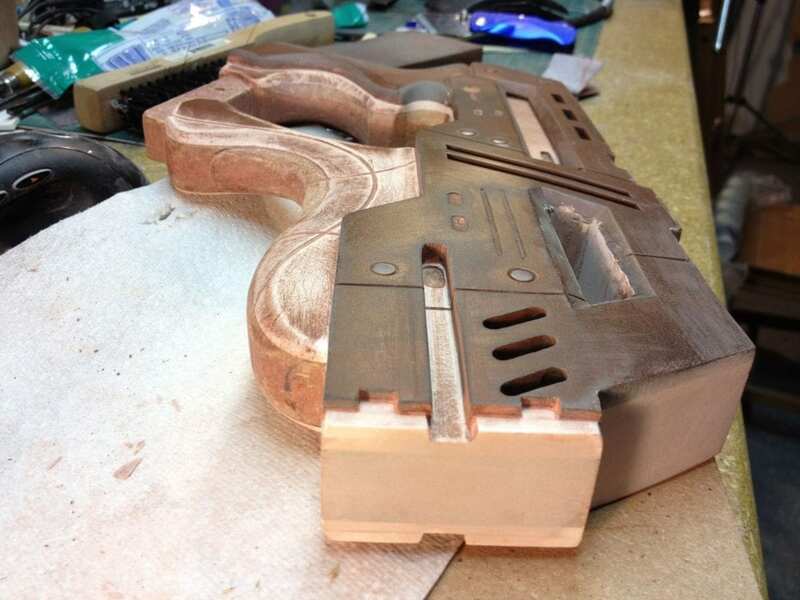 I decided to go with one solid piece this time, as opposed to the four piece job I did on the N7 Eagle. 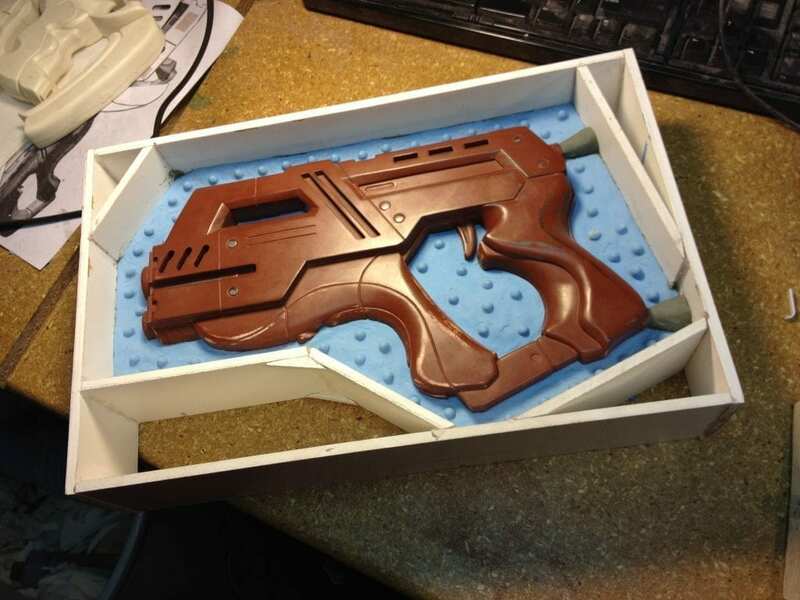 The entire thing got clayed up and jammed in a box for molding! 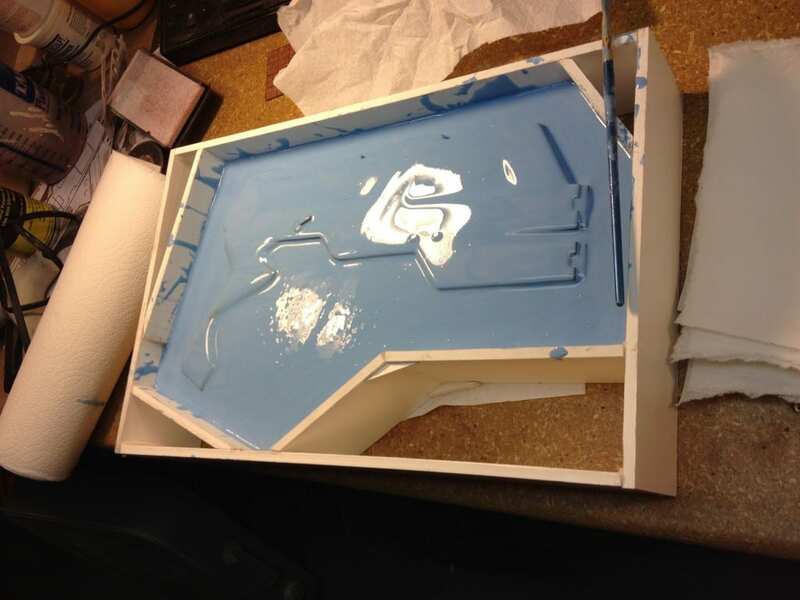 I used Tap Plastic’s Silicone RTV for making the two part mold. 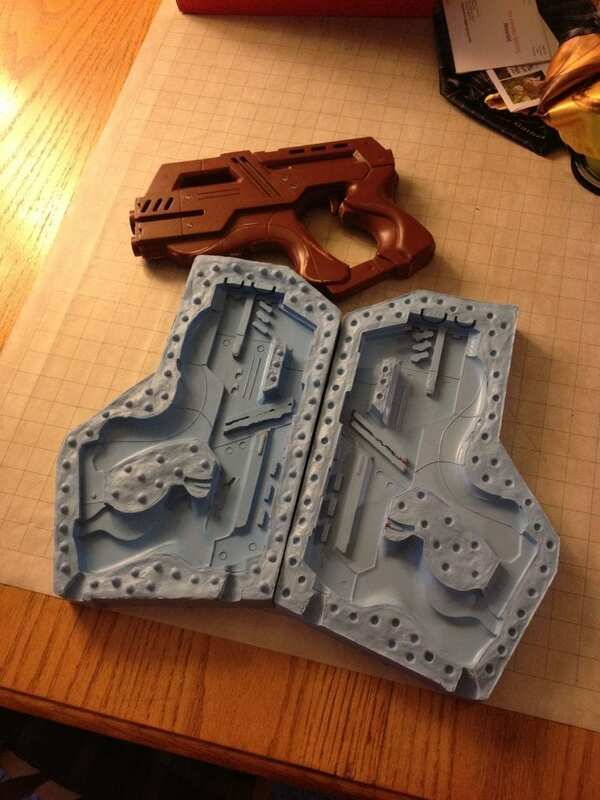 This is by far the most satisfied I have been with a mold. I took my time with it and the end result is super clean! 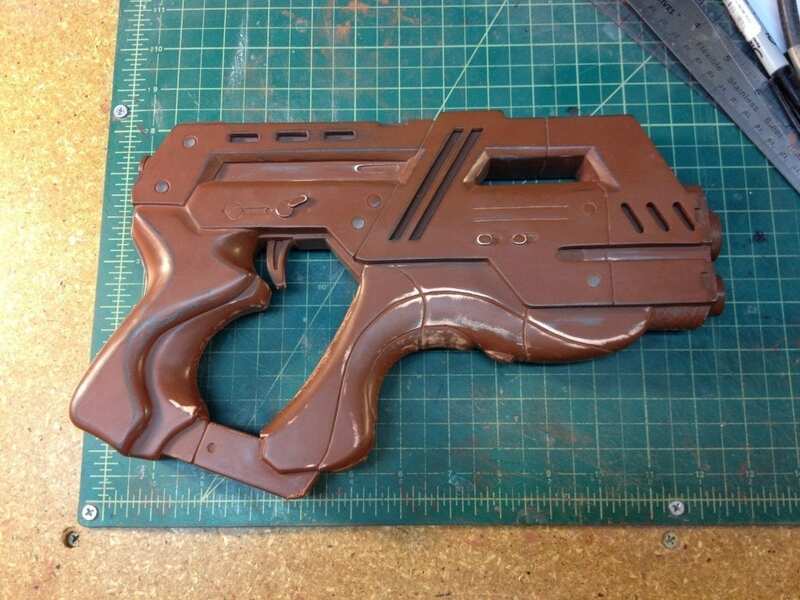 From that mold I cast one single piece. 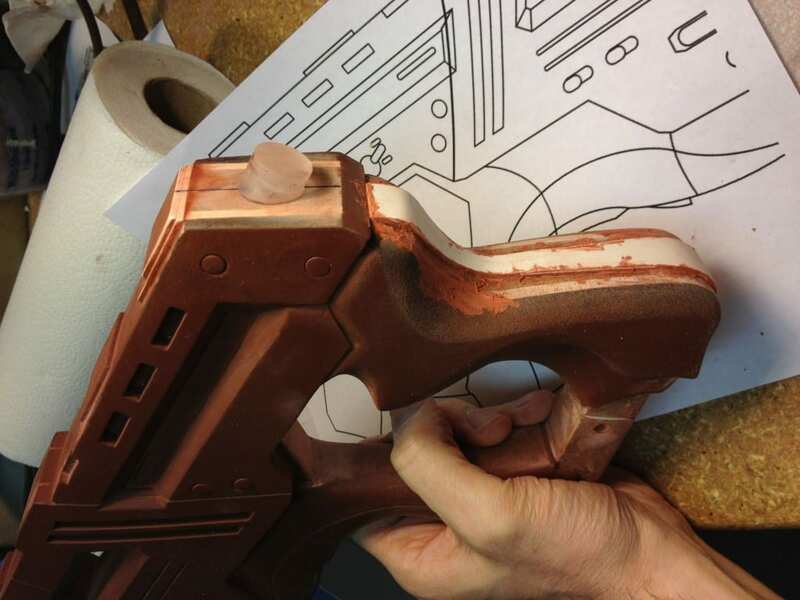 I ended up pouring three layers into each side before putting the mold together and slush casting the rest of it together. Even though it was slush cast, the first one ended up being nearly solid (oh well). This piece is 2.5 lbs of resin, you could knock out a disgruntled grizzly with it. 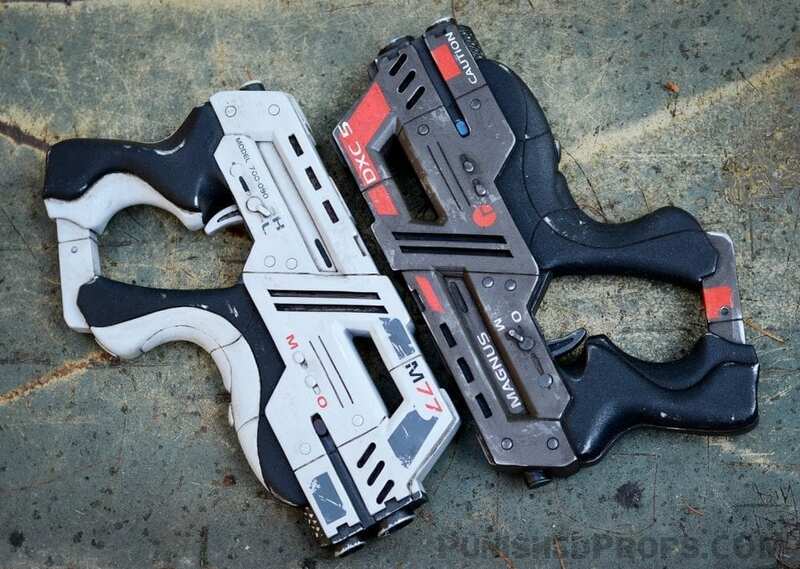 The shape of this gun is the same for both the Carnifex and Paladin guns in Mass Effect. 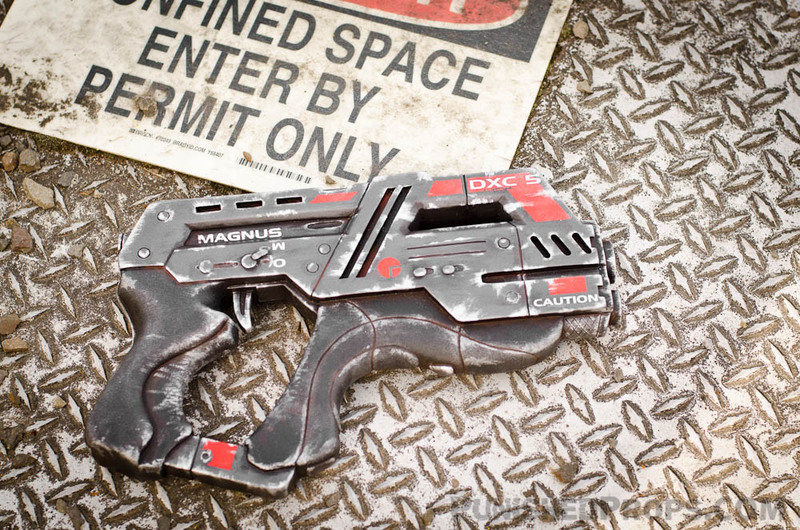 The client wanted a Carnifex, so that’s how I painted this copy, but I had vinyl decals printed for the Paladin too in case someone wanted it painted that way. In fact, I’ll probably paint the master like a Paladin for myself. 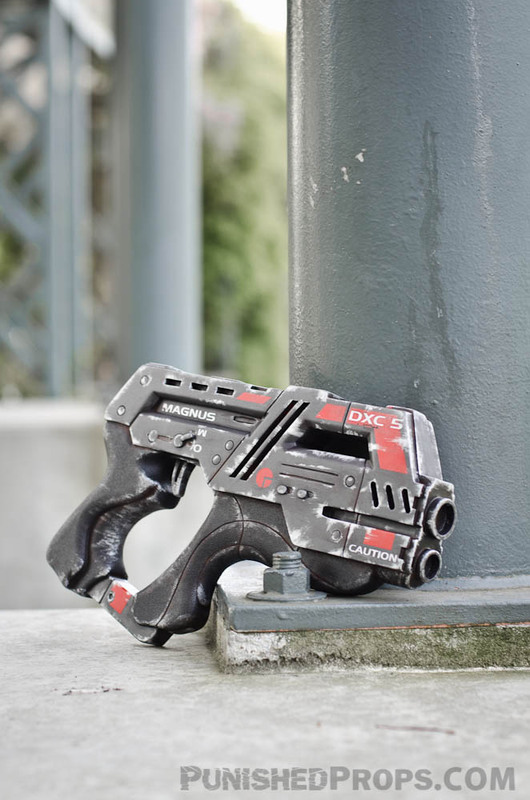 The texture on the grip is RustOleum’s Multicolor Texture spray paint. 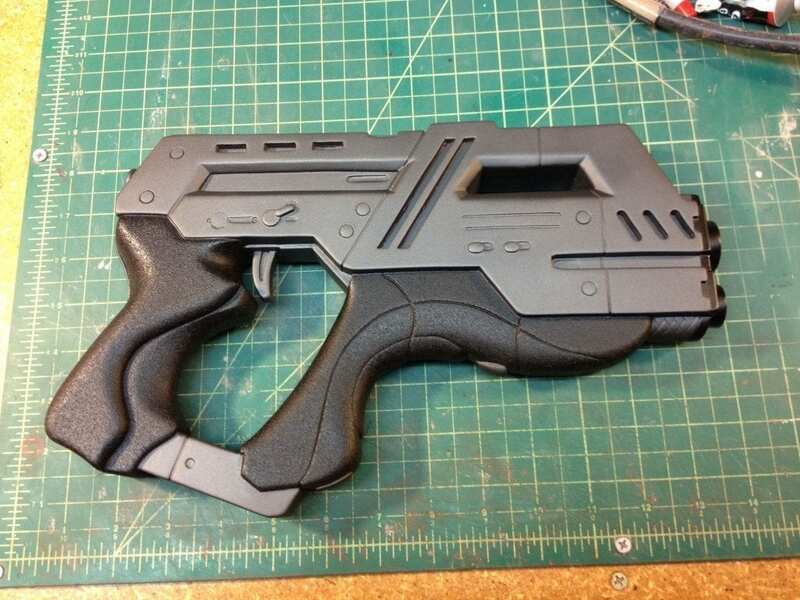 The solid colors are just enamel black and gunmetal gray that I applied with my airbrush. The decals are also enamel that was brushed or sprayed on using vinyl decal stencils that I had cut at Fedex/Kinkos. 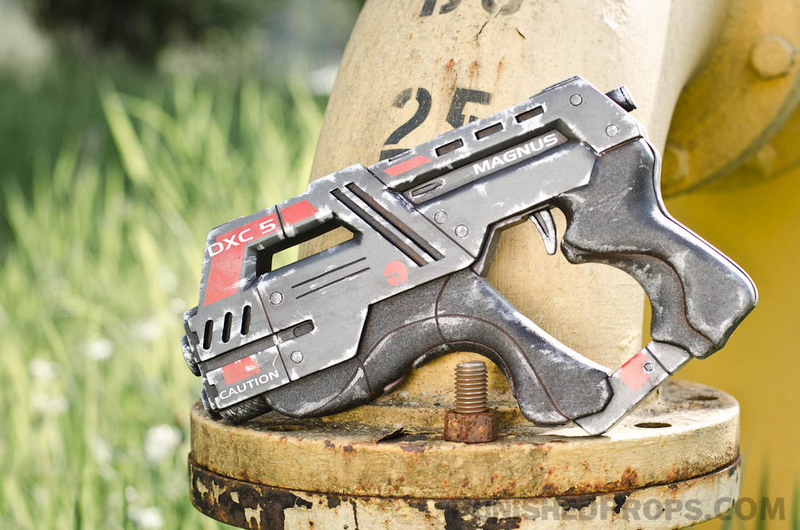 All of the weathering was done with brushes using acrylic paints and Rub ‘n Buff.